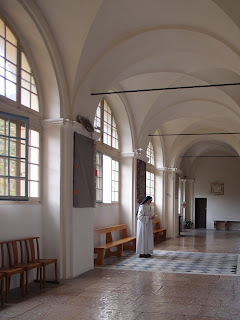 One of the nuns stands in comtemplation before entering the chapel. Our Lady of Laghet is the name of the Virgin Mary associated with the name of this small village which was first mentioned in a charter of the 11th century. In the 12th century, Laghet was part of the fiefdom of Eze and mention is made of a small chapel. In the 15th century, the chapel served as a small shrine for shepherds and peasants but it was modest and had been built in an exposed position and was slowly falling apart. In 1625 an ardent priest, Don Jacques Fighiera was so moved by the abandonment and decay of the chapel of Laghet, he decided to devote himself to rebuilding it. By 1628 it had a new roof, he leveled the land, he whitewashed the walls, and hung a door with a lock, He also repaired the path that leads to Laghet from Eze and all at his expense 'in honor of God and the Virgin Mary.' Then he announced to the public that the chapel of Laghet had been restored and he took the service, in a voluntary capacity, for the next 25 years. 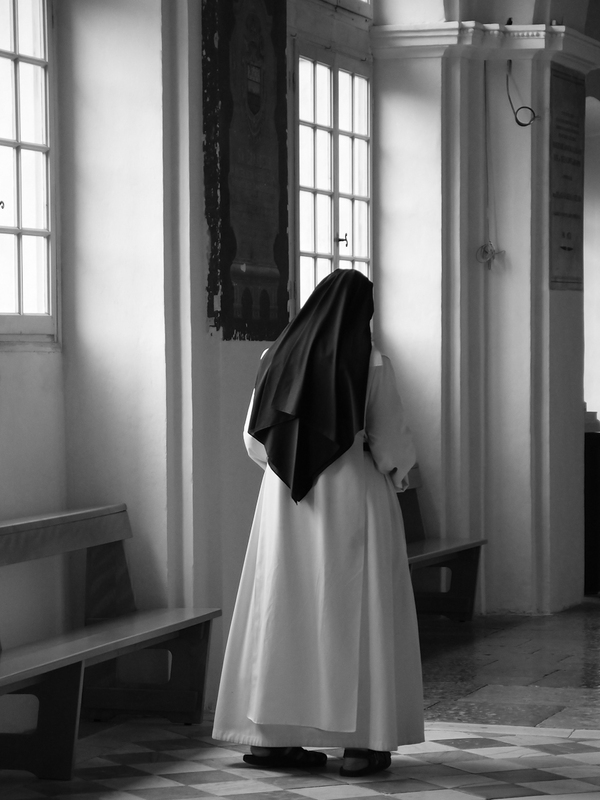 I love photos of contemplative nuns, and yours today is superb. Perfect choice of b&w for this image. Thanks for the background info about the place too. PS - all this is sooooo different to the glitzy-glam atmosphere of Monaco, it's amazing. superbe lumière ; divine ? I love the first shot. So much emotion. It evokes a feeling of peace and serenity. Such a difference from so many Monte Carlo scenes. B&W is a perfect choice!